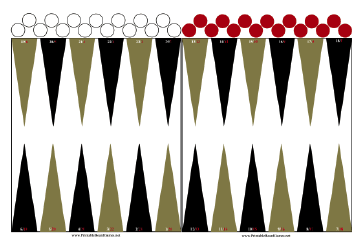 This tan-and-black backgammon board has white and red checkers and is a perfect game for two people. Instructions are included. This game requires two dice. These printable board games are easy to download, customize, and print. These printable board games are available in .PDF format. Just download one, open it in a PDF viewer, and print. If you don't see a board game or category that you want, please take a moment to let us know what you are looking for.